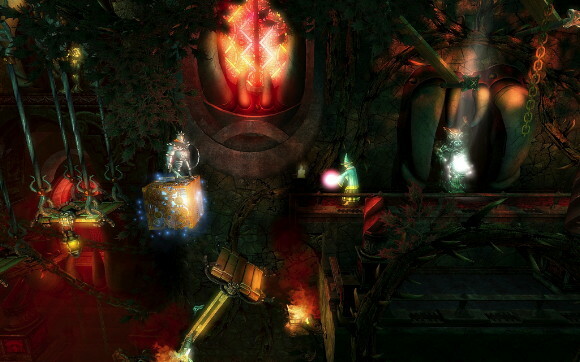 We previously reported a few bugs with the PSN version of Trine. It was brought to our attention that our source had a few issues with the game that weren't directly related, and it was recommended we take on the challenge of playing Trine ourselves to see how it works. We've now played Trine in our very own co-op brand of reviewing, and are ready to set the record straight. First, the issues that were reported previously about the PSN version. According to our source, there was major frame rate lag, as well as a few targeting bugs. We are happy to confirm this is not the case. According to Frozenbyte, PS3 peripherals interfere with the way the game flows. By unplugging things like the Playstation Eye, this issues were resolved leading to a much more positive reception. Now that we've got the technical stuff figured out, it's on to the co-op gameplay on the Playstation Network. When playing single player, you'll control 3 characters; a wizard, a knight, and a thief. Each of these characters can control different aspects of the game. When playing co-op, you can not duplicate these characters. For instance, if player one is the knight, player two can switch between the thief and the wizard. Since you often need to switch between the three characters to advance through a level, it's essential that you communicate with your buddy. That being said, once you and your co-op partner are synced up, you'll be able to find more of the hidden or hard to reach collectibles throughout the levels. The puzzles through each area are half the fun of the game, and having additional players makes maneuvering around obstacles that much more fun. The PSN version of Trine matches up to our Trine PC review in all respects - just remember to unplug your extra USB peripherals to ensure the game runs properly, and you'll be able to enjoy a variety of interesting co-op Trine levels as well as our original 4/5 co-op score. Page created in 0.4368 seconds.